Advanced flexible display technology is making flexible communications displays cost effective and allowing for the positioning of digital signage in locations previously thought impossible. Make no mistake about it: the advent of flexible digital displays isn’t going to transform the digital signage industry; it is going to revolutionize it beyond our wildest imaginations. Because of the infinite number of uses and applications that benefit from lightweight displays, the flexible display revolution is starting to unfold. Whether it’s small, backlit countertop displays, hanging window displays, electronic message boards, digital billboards or large-scale digital video displays, the uses for digital communications displays are as varied as the brands that manufacture them. So many industries utilize signage—store fronts, event venues, event production companies, billboard advertisers, transit centers, bars and restaurants, stadiums and arenas. As such, the digital signage market is fragmented with unique products specifically designed to cater to every possible need. Let’s use the Ontario Progressive Conservative Party’s 2011 Greater Toronto Area Dinner as an example. To make sure every attendee at the event could clearly view party leader Tim Hudak’s speech, the event’s production company, Metalworks Production Group, knew they needed a super-bright and vivid display that could be viewed from any angle, up to hundreds of feet away. They approached the audiovisual experts at APG Displays for a solution. The company recommended installing two NanoLumens NanoFlex 112-inch flexible digital displays on both sides of the podium. This proved to be the perfect solution. The event turned out to be the largest and most successful dinner in the party’s history, drawing more than 800 supporters and candidates and raising nearly $1.5 million for the party. Because the dinner was only a few hours long, it was vital for the solution to be easy to set up and removed, without requiring a crew of workers. 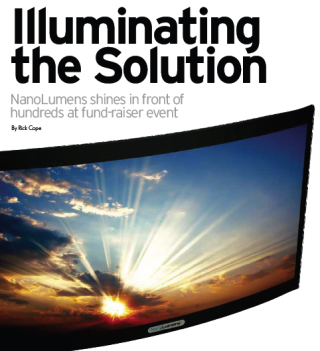 The NanoLumens NanoFlex displays were able to satisfy this requirement as they weigh 85 pounds, need minimal labor to install and don’t require any heavy or cumbersome rigging. The staff and Metalworks appreciated the NanoLumens screens delivered a sharp picture quality from all angles. The picture had the same vibrant, bright colors from 20 feet away or 200 feet, and there was no loss in quality from off-angle viewing. Even when viewing from an extreme angle close to the screen, it exhibited none of the color drop-off or fading typical of other display technologies.